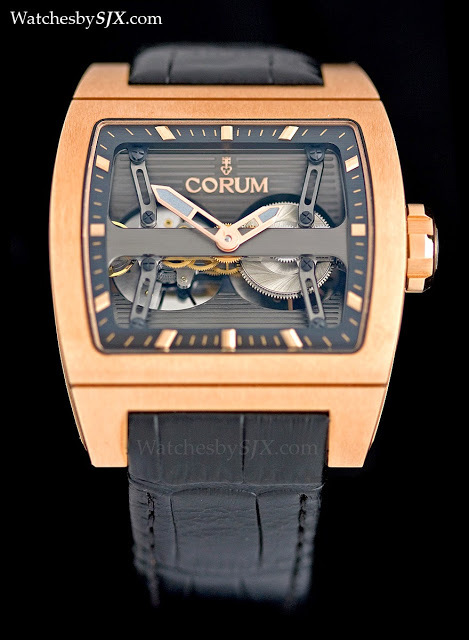 The Ti-Bridge is the 21st century take on Corum’s classic Golden Bridge. For the first time, a compact automatic winding system has been devised for the Ti-Bridge. 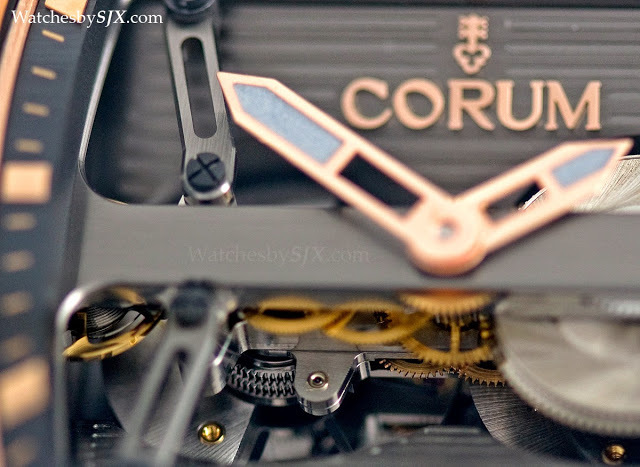 Fitted with a tiny baguette movement suspended in the case, the Corum Golden Bridge has always been about the beautiful of a movement’s architecture, and so it is with the Ti-Bridge. 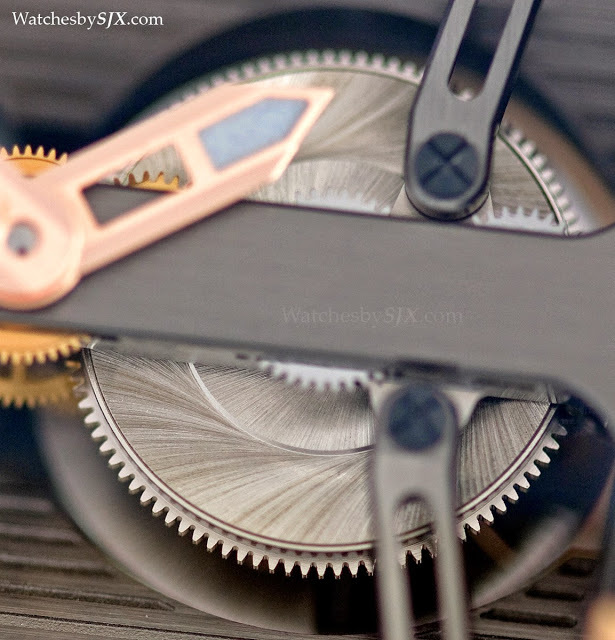 The Ti-Bridge Dual Winder uses the same tiny baguette movement, installed horizontally and supported by titanium struts. 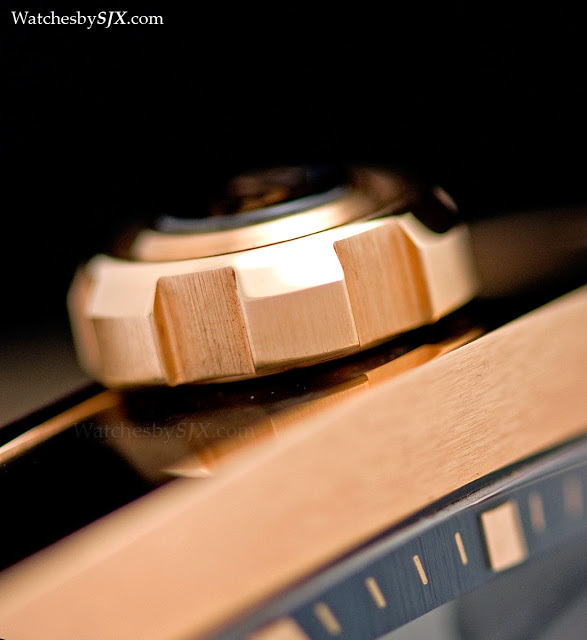 But now it has an self-winding mechanism, added to the bottom of the baguette movement. 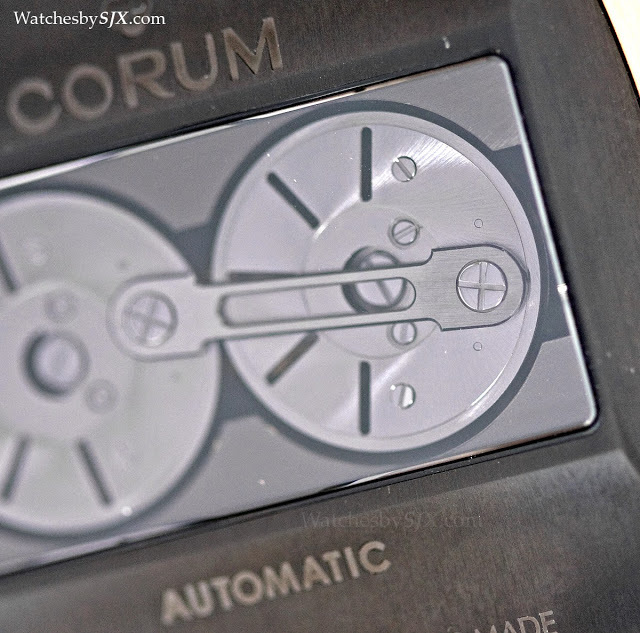 Located at nine o’clock on the dial side, the compact winding mechanism, which uses ceramic ball bearings and is lubriction free, winds up the single barrel which sits at three o’clock. Over the back the twin tungsten rotors, arranged in-line and linked by a coupling rod, wind in parallel, functioning like the coupled wheels of a locomotive. 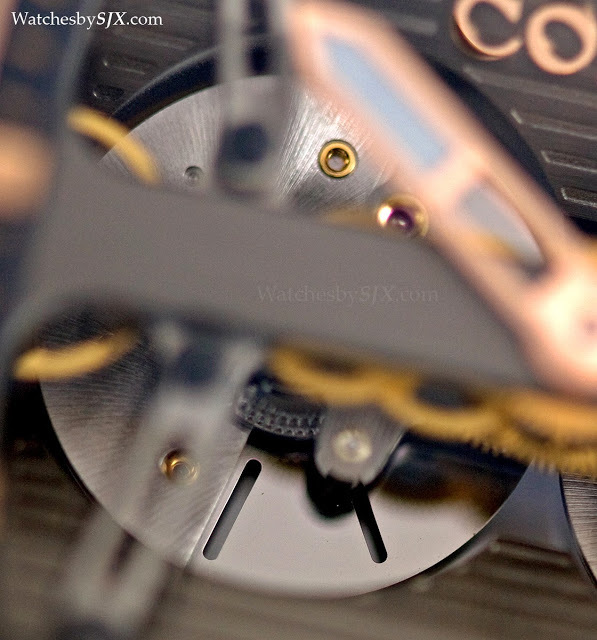 The automatic mechanism adds to the height of the movement, but the constructors have cleverly used a slightly domed case back to accommodate the new movement. 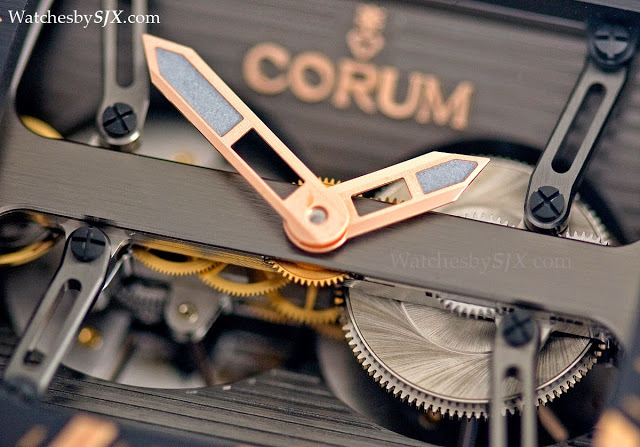 Thus the case remains the same as that of the hand-wind Ti-Bridge in size, at 42 mm by 52 mm. 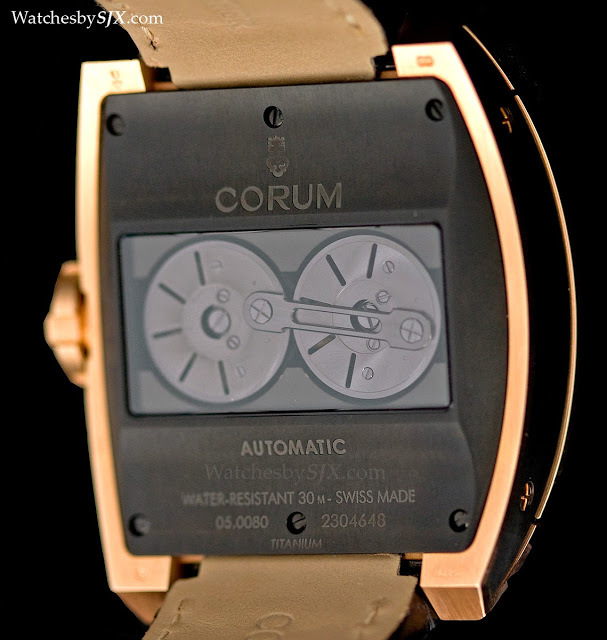 However, the domed case back does not sit as well on the wrist as the flat and curved back of the manual wind Ti-Bridge. 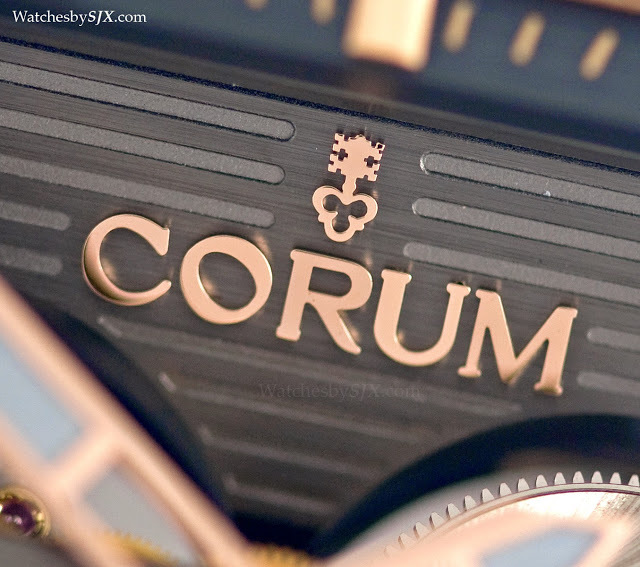 Like the rest of Corum’s newer movements, this was developed by Laurent Besse, who heads its technical development team. 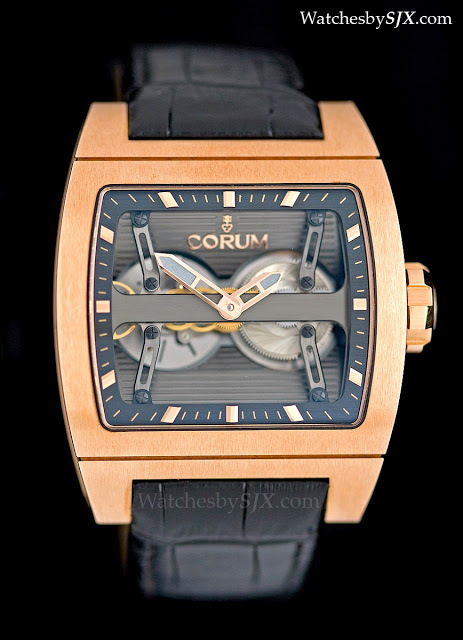 He was part of the pair behind Les Artisans Horlogers, which created the MB&F HM4 movement, before it went bust. 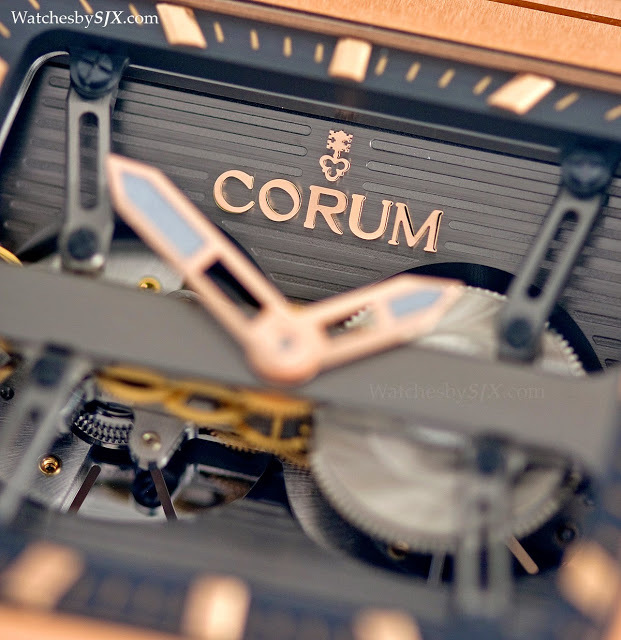 And just earlier this year AHCI co-founder Vincent Calabrese, designer of the original, delicate Golden Bridge of the eighties, joined Corum as well. The modern “Bridge” movements cannot get any better in terms of provenance. From the front this looks almost identical to the hand-wind Ti-Bridge, save for the winding mechanism partially visible beneath the movement. 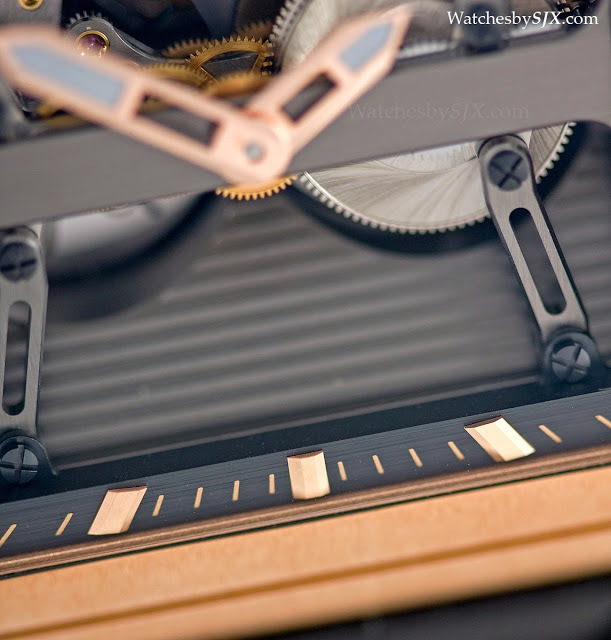 Like the other versions of the Ti-Bridge, the movement appears to be suspended above a gentle valley formed by the dial. And unlike earlier versions of the Ti-Bridge, the movement here is secured by four titanium beams. 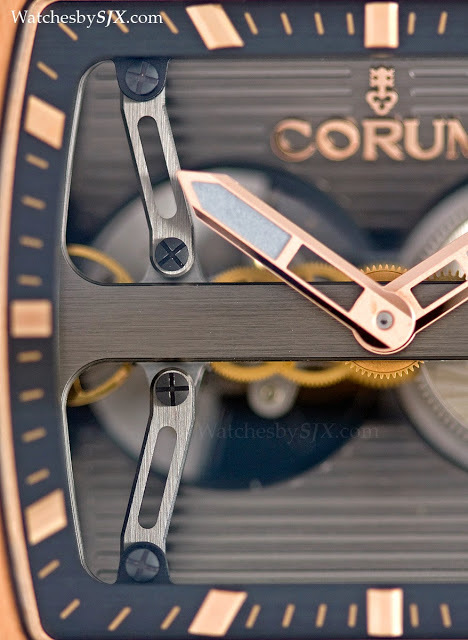 Whereas in the previous versions the titanium struts were V-shaped, which obscured some of the movement. 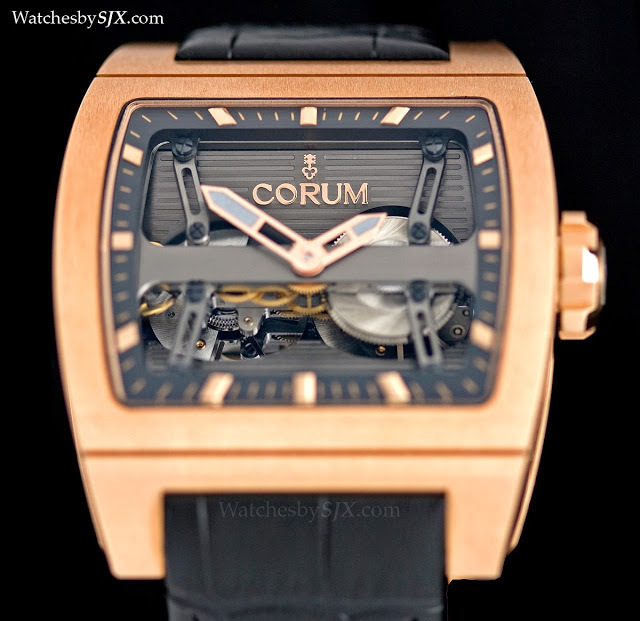 Pictured here is the striking rose gold model (also available in titanium), which has black PVD coating titanium inserts on its flanks. The case is well detailed and finished, save for one detail. 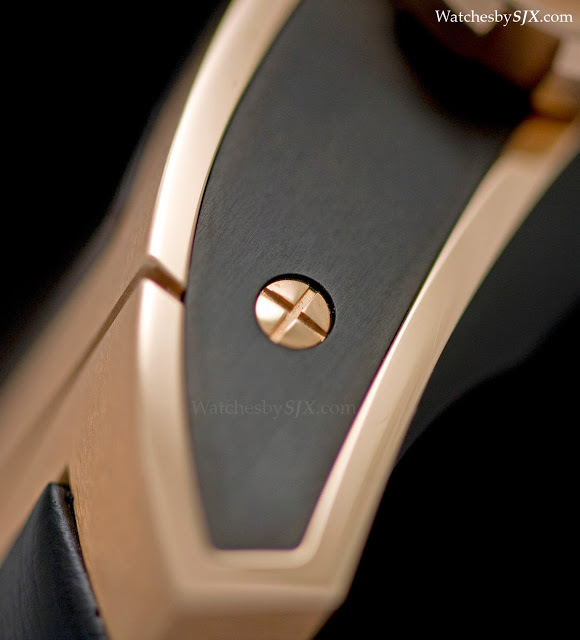 While I love the size and shape of the rose gold crown, it has the same unsightly plastic insert that afflicts all of the Ti-Bridge watches.